I have just come across the article “An Economist’s Guide to Climate Change Science“, written by Solomon Hsiang and Robert Kopp, published recently in the Journal of Economic Perspectives, Fall 2018. They mainly summarize the recent literature on climate change and provide some insights from economists on this topic. Should you read their article? What is missing from it? Yossi Sheffi, a Professor of Engineering Systems at MIT, and Director of the MIT Center for Transportation and Logistics, recently wrote an article on Project Syndicate entitled “Green Lobby’s Misdirected Anger“. He argues that our current efforts to curb carbon emissions are insufficient to keep temperature increases below 1.5°C and suggests the only real alternative is geoengineering and nuclear fusion. I disagree. I have recently come across this new working paper by Timothy Besley and Avinash Dixit. They develop a theoretical model in order to understand how much consumption society should give up in order to mitigate catastrophic risk. I am not really happy about something there. Do sovereign ratings lead to a self-fulfilling prophecy? One of the main questions raised during the past years was whether the rating agencies’ downgrades of sovereigns lead to additional adverse effects on those sovereigns that have their ratings changed. All the debating over sovereign rating made me ponder whether everyone is a hypochonder... and thus I studied this question above based on data from European countries (a panel of 26 countries and 17 years). The main result: I found that there are two-way feedback effects between macroeconomic conditions and the sovereigns’ ratings. This, for example, means that a sovereign’s rating downgrade will lead to a reduction in economic growth, which then vice versa leads to that sovereign’s downgrade again. This vicious cycle thus implies that rating changes can exaccerbate already existing problems of macroeconomic stability. You can find the paper HERE, it is forthcoming in the journal Economic Modelling. This paper assesses the impact of a global phase-out of nuclear energy on the costs of meeting international climate policy targets for 2020. The analyses are based on simulations with a global energy systems model. The phase-out of nuclear power increases greenhouse gas emissions by 2% globally, and 7% for Annex I countries. The price of certificates increases by 24% and total compliance costs of Annex I countries rise by 28%. Compliance costs increase the most for Japan (+58%) and the USA (+28%). China, India and Russia benefit from a global nuclear phase-out because revenues from higher trading volumes of certificates outweigh the costs of losing nuclear power as a mitigation option. 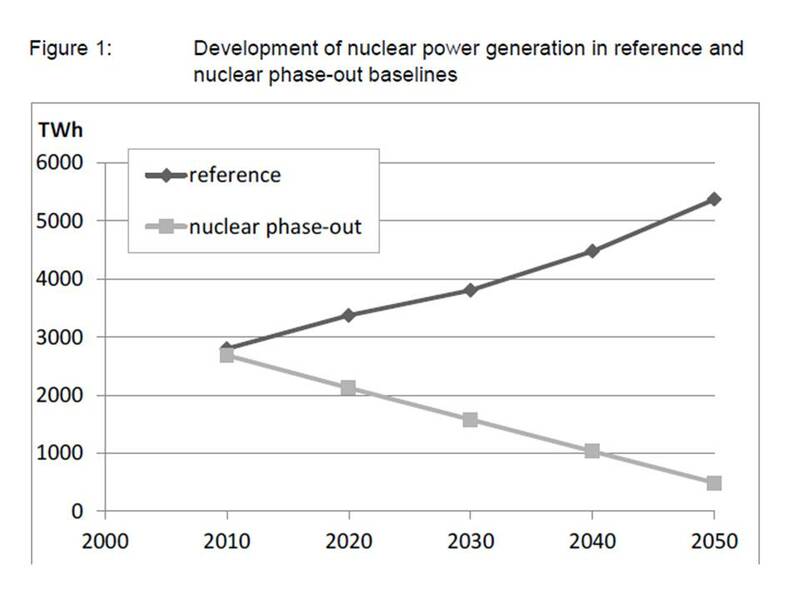 The authors then compare two scenarios, the nuclear phase-out scenario, where no new plants are built and existing plants are progressively decommissioned. They assume that by 2050 the production of electricity fromnuclear power plants is reduced to about 1% (i.e. 500 TWh) of global power generation (compared to the 11% that is expected). The climate policy scenario includes GHG emission targets for Annex I and non-Annex I countries for 2020 that are deemed consistent with meeting the 2°C target. Compliance costs are the costs for meeting a country’s emission target. The authors compare the compliance costs in the climate policy scenario and and the nuclear phase-out scenario. I think the most interesting results that the authors present are that the largest increase in overall compliance costs are faced by the US, which will be 21 billion €. For Europe, the change in compliance costs is only something like 3 billion Euros. For countries like Russia or China, the estimate is even negative. So let’s do the calculations: Is roughly 28 billion USD, something like 0.17% of US GDP or 0.025% of annual US GDP, enough money to make Americans continue to rely on nuclear energy? Given estimates for e.g. the Fukushima accident of 187 billion, and quickly calculating that the probability of another nuclear disaster of INES 7 scale is roughly 3 (Kyshtym, Chernobyl and Fukushima) out of 50 years, thus one disaster every 17 years, implying half a Fukushima until 2020, thus expected costs of roughly 94 billion Euros (187/2), would imply that if we integrate the costs of a potential nuclear disaster into the calculations, then it would already be worthwhile to phase-out nuclear energy simply on the argument of a expected costs in case of a disaster. implies good-bye nuclear, hello sustainability. Now obviously there are downsides to the modelling approach that the authors used: e.g. they relied on POLES, which is a partial equilibrium framework. Thus, the evolution of macro-variables like GDP are given, so this excludes second-round feedbacks from the costs of a nuclear phase-out, i.e. potentially higher energy costs to GDP, etc. Whether these energy costs then will be higher depends on place and policy, see HERE. NOW – if we view the authors’ work as a benchmark, then it at least gives some hints as to the potential costs of a phase-out, and they are much lower, on both the global and the regional scale, such that it is definitely worthwhile to consider phase-out as an option and to rid ourselves of the policy propaganda of the nuclear industry and tag-along politicians. Here you have it, I said it. Btw – some of the authors work at http://www.oeko.de, check it out, they are doing interesting work over there. A neat new paper has just come out in Ecological Economics that compares the traditional measure of `welfare’, namely GDP, with the Genuine Progress indicator, as well as other indicators (e.g. Ecological Footprint). This is a nice idea, and I just want to present some results of that article, but also point towards some questions that arise after reading it. Main Result: While global Gross Domestic Product (GDP) has increased more than three-fold since 1950, economic welfare, as estimated by the Genuine Progress Indicator (GPI), has actually decreased since 1978. Globally, GPI/capita does not increase beyond a GDP/capita of around $7000/capita. This result is a powerful one for obvious reasons: If that is true and if GPI is a better measure of welfare than GDP (which it, if it is well-adjusted, definitely is), then it means that GDP is overstating welfare after a country has reached a certain level of development. Plus, it is likely that GPI correlates more strongly with measures of happiness than GDP does, since happiness also does not increase for income levels above approximately $8000/capita. While one can always claim that the method used by the authors is wrong for some reason, and it certainly is a very crude method, this is a first result in this line of literature and I am sure that in the future there will be more work on trying to improve this. For example, the method suggests that for the other half of the planet that the data currently does not cover, the GPI is qualitatively similarly related to GDP to the countries in the current sample in order for the extrapolation to work. This may be true for some countries, but more difficult to accept for less industrialized countries like sub-Saharan Africa. Looking at the GPI for Belgium, Italy, Germany, Poland and New Zealand, we see huge varieties over just a few years. While this may be understandable for countries with large regime changes as it was the case in Poland, this is somewhat surprising for Germany, Belgium or Italy. For example, taking the years 1980 to 1985, we see a decline in German GPI from an index value of 120 to 90 in five years. But I don’t know about anything that significant that should have led to that drop. Instead, the crisis of 1973 should have been picked up in the data. Unemployed had more than tripled during that time, inequality should have increased, etc. Plus towards the end of the 70s the heavy industry in Germany started to shut down, so there should have been an improvement in the environmental quality. But this also doesn’t show up in the data. So, overall, I have a hard time to see what the GPI really captures here, i.e. whether the data are good enough to tell us something. So we would really have to look more closely at the components of GPI to know what is going on behind the scenes. Also, from a policy maker’s perspective, it would be difficult to deal with these large shifts in the GPI. If there are these huge annual shifts, then this requires quite a lot of annual changes in policy. But think about the policy making agenda – it sometimes takes ages to push for a new policy, and thus we may find ourselves always lagging behind in action. Plus, the GPI consists of many components that focus on different things, like environmental quality or education. So in this aggregated measure, there may be increases in education but decreases in environmental quality, that then simply get washed out in the aggregate. This problem, together with the drastic annual changes, may make it more interesting to focus directly on the disaggregated measures, meaning to look at a variety of indicators. I am also at odds with some of the conclusions by the authors. For example, they write that “Germany’s Ecological Footprint/capita increased paralleling GDP/capita from1950 to about 1970, after which increasing environmental awareness led to a decreasing footprint/capita.” This is not correct, since international competition basically destroyed the German coal mining industry in that period, and heavy industry started to leave Germany. Obviously this does not affect their conclusions, but it is useful to get the story right. There is a lot more in the dataset and in the quick study that the authors presented, so it is well-worth going through the paper. Though I have a difficult time to see whether historical measures of GPI are well-comparable across countries and even within countries, I believe that it is worthwhile to do that exercise and to try improving upon previous estimates. This is an important line of research that may eventually get us closer at pushing politicians and the general public to move away from GDP as a measure of well-being to something more holistic.